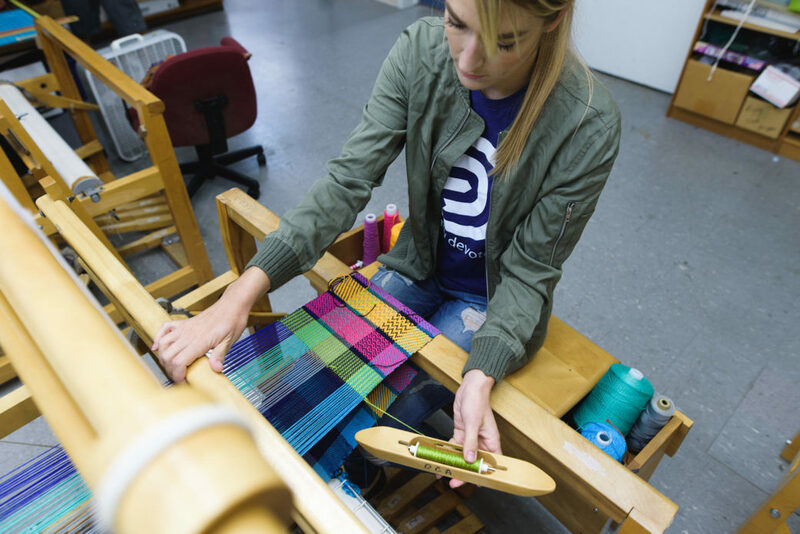 Students enrolled in an eight-week weaving class at Oklahoma Contemporary may use the designated studio during Open Studio Saturday and Sunday. Our weaving class provides instruction for beginning, intermediate and advanced weavers. Students enrolled in Weaving 1 learn fundamentals by weaving a sampler on a four-harness floor or table loom, while students enrolled in Weaving 2 choose from traditional or contemporary designs to weave on a four- or eight-harness floor loom. Enrollment is limited. Our weaving class provides instruction for beginning, intermediate and advanced weavers. Students enrolled in Weaving 1 learn fundamentals by weaving a sampler on a four-harness floor or table loom, while students enrolled in Weaving 2 choose from traditional or contemporary designs to weave on a four- or eight-harness floor loom. Enrollment limited. Open Now until 10 p.m. • April 20, 2019 @ 7:45 p.m.